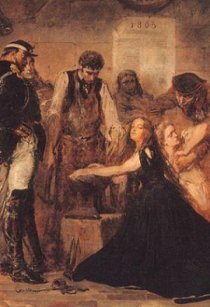 On this date in 1864, the leadership of Poland-Lithuania’s abortive January Uprising against the Russian tsar was hanged before 30,000 at Warsaw Citadel. Romuald Traugutt depicted (somewhat ironically) on the 20-zloty note of Soviet bloc Poland. Romuald Traugutt (English Wikipedia link | Polish) had been a decorated Lieutenant Colonel in the Tsarist army, and a heretofore apolitical man — but he resigned shortly after the outbreak of the doomed national uprising to take up sides against Russia. This installment of the venerable Russians vs. Poles series was characteristically nasty. 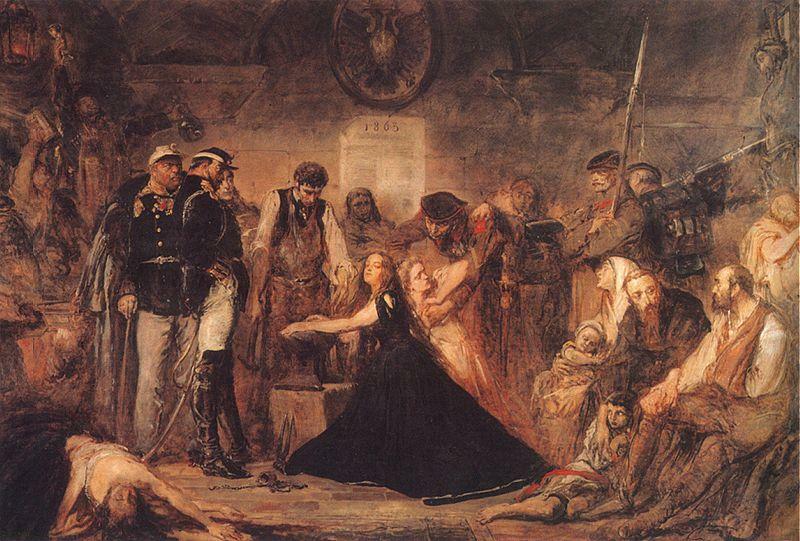 In 1863 – Polonia by Jan Matejko, an allegory for the Polish nation is manacled by the Russians. And it ended the way these affairs have ended these last 400 years or so: Russian victory. In addition to this day’s batch — Traugutt along with (all Polish Wikipedia links) Rafal Krajewski, Jozef Toczyski, Roman Zulinski and Jan Jezioranski — a further 391 were put to death after the war; tens of thousands were deported to Siberia or otherwise scattered in the vast Romanov empire; a war indemnity tax was imposed; and over three thousand estates in Poland and Lithuania were confiscated. Traugutt has gained some latter-day support in the Catholic Church for beatification.